Ever since the NIGMS Feedback Loop launched in 2005, we’ve sent periodic digests of its content to our grantees, applicants and others. To help our readers receive time-sensitive information sooner, we’re now offering a way to get individual posts as they’re published on the blog. 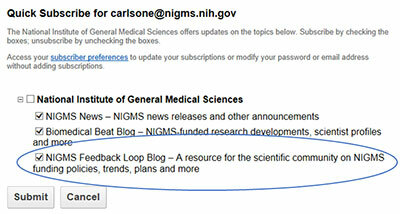 If you’d like to receive new posts by email, go to our email updates page, enter your email address, click the Submit button and then check the box next to NIGMS Feedback Loop Blog on the Quick Subscribe page. Each time we add a post to the blog, you’ll get an email message with the first part of the post and a link to the full version. We average about 4 posts per month. For the time being, we’ll continue emailing the digests of recent posts. If you subscribe to receive individual posts and no longer want to get the periodic digests, you can cancel your digest subscription. You can also follow the blog via its RSS feed. This is the 500th Feedback Loop post. We’ve made numerous changes since the blog launched in 2009, but one of the things that’s stayed the same is the importance of your input. Your responses to our posts have given us valuable information and insights on our policies and plans. They’ve also helped us identify topics that interest you or that we could clarify. If there’s a topic you’d like us to write about—or if you have any other feedback for us—please leave your suggestions in the comment section below or email me. Lab Size: Is Bigger Better? 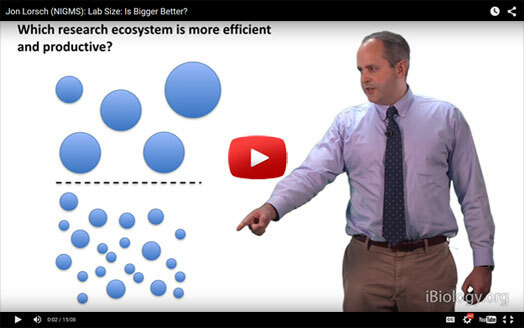 In a new video on iBiology, NIGMS Director Jon Lorsch discusses the relationship of lab size and funding levels to productivity, diversity and scientific impact. Read the Molecular Biology of the Cell paper mentioned at the end of the video for more discussion of lab size and other topics related to maximizing the return on taxpayers’ investments in fundamental biomedical research . New Webinars Connect Applicants to NIH Peer Review Experts: The Center for Scientific Review is hosting webinars in early November to give R01, R15, SBIR/STTR and fellowship grant applicants and others useful insights into the submission and review processes. Register by October 28. New Video Tutorials Can Help You Navigate eRA Commons: A 10-part series of short video tutorials walks you through the steps for submitting just-in-time information, a no-cost extension, a relinquishing statement and more. Watch the tutorials on the NIH Grants playlist on YouTube. Similarly, we plan to post monthly digests of relevant highlights from the NIH Office of Extramural Research blog. Here is the first digest of funding opportunities. Please let me know if you do or don’t like this format or if you have suggestions for ways to improve its usefulness to you. 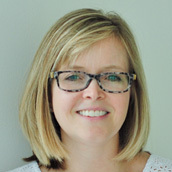 Before transferring to the NIH Office of the Director in October 2017, Emily oversaw the Feedback Loop and other efforts to inform and engage different audiences on NIGMS' goals, activities, and results.